As I’ve often commented while attending and covering the SXSW Interactive conference each year, the term “Interactive” has usually been painted here in huge, rolling strokes that cover any and everything from autonomous cars to music streaming and movie technology, and yes, an endless landscape of apps (more apps than any sane person needed to know about). SXSW– with its mix of tech tools and trends from many quarters– interactive, music, apps, VR, AR, cinema, consumer– could always make even the most seasoned/jaded tech industry analyst’s head spin, and spin. And a lot of it was not relevant to the business models or technology wish lists of sophisticated video, AV, or collaboration technology providers (or their customers). Fast forward (not, I advise, while wearing a VR headset) to SXSW 2018– and what a difference a year makes. This year the landscape at SXSW– taking place this week in Austin, TX– has changed dramatically. Out is so much obsession with smartphone apps, and in–if you know where to look– is the kind of interactive technology that would make any seasoned veteran of the NAB, CES, ISE, DSE, or InfoComm shows pause and take notice. What’s changed? Simple: larger (and some huge) digital palettes (think bigger displays, direct-view LED, and large venue projection), and VR, AR, and AI have finally turned the attention of SXSW and its corporate attendees (the SXSW Interactive portion of the event that has 35,000 badged corporate attendees) away from all those apps and toward the new kinds of immersive technologies that are raising the bar for all things experiential. If you’re reading this, you know about this kind of transition to experiential technology from AVIXA. SXSW won’t replace a trip to the InfoComm show or NAB for tech providers, but the larger world of technology– larger in both a platform and a demographic sense– represented at SXSW is coming closer to our world, even as we move toward theirs. Meeting in the middle? Maybe not this week, but the movement is exciting. Exciting because everyone on the NAB/InfoComm/CES side can teach the larger (SXSW) side how to get more serious about industrial strength tech tools. And the SXSW world can teach a lot to the NAB/InfoComm/CES side about where and how most of the current end users – and all of the future ones– live and work and think. There is no better way to illustrate how SXSW has changed, and how the different worlds are coming closer to each other, than with two prominent finalists in this year’s SXSW Interactive Innovation Awards. Hundreds of projects were entered for a chance at the top honors in each of 13 categories– that cover AR and VR to Smart Cities to Health & Bio to Data and Privacy to AI & Machine Learning to Visual Media technology. But two of the finalists should catch your attention here. In the Responsive Design category, the entry (and finalist) KONTINUUM, an “underground journey through time” by Moment Factory and the city of Ottawa. And in the Visual Media Experience category, the entry (and finalist) GE – Unseen Stars by BBDO New York, New York, NY, with that project’s tech provider, Obscura). Moment Factory’s entry into the Responsive Design category, KONTINUUM, an “underground journey through time” was a unique project that transformed a space from what would have been a troublesome construction site and commuter disruption in the heart of a city of Ottawa into a fun, engaging multimedia experience for thousands. As part of the 150th anniversary of Canada’s confederation, the Ottawa 2017 Bureau and Moment Factory co-produced an immersive underground experience in what was to become the Lyon station of Ottawa’s new Light Rail Transit (LRT) system. An original idea by Ottawa 2017, the interactive multimedia installation was designed to position the city as a leader in innovation and creativity and spark visitors’ interest in the upcoming LRT initiative. The best part of it: KONTINUUM was done not with apps and smartphone tools but with the highest level displays, projection, image processing and experiential content tools– transforming a construction problem into opportunity for tourism and unexpected positive experiences. As visitors entered the space, they become digital (a 3D scan of their body to their linked to their ticket ID) and can influence and control all of the responsive immersive media stations. During their tour their "avatar" appears regularly as a digital alter ego following them. At the end there is a photo booth where their "tribe" appears together. To maintain the experience after departure visitors can download their avatar online and play it in a Hologram Pyramid. Visiting the Finalist Showcase at the Hilton on Sunday at SXSW in Austin (a preview of all the finalists before the Interactive Innovation Awards ceremony that takes place Tuesday evening March 13 at SXSW), I spoke with both Moment Factory, and Obscura, about their entries, and about how they see the cross-pollination of technology solutions across different markets and different demographics. There may be no better spokesperson for benefits of more cross-pollination between the AVIXA and NAB worlds and the SXSW world than Amahl Hazelton of Moment Factory. 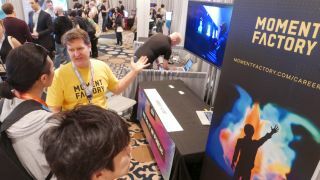 Amahl held forth all day at the Finalist Showcase for the SXSW Interactive Innovation Awards on Sunday, explaining to a throng of attendees the goal of both the KONTINUUM project and the design and technology philosophies of Moment Factory. I asked Hazelton if he sees, outside of one trade conference, more bringing together of the pro video and AV world with the larger world represented by SXSW and other, broader tech communities including end users. “Moment Factory has observed enormous growth of interest in video and AV solutions outside of the traditional pro video/AV, or entertainment industries.” he replied. “Destinations of all stripes ranging from sports and entertainment venues, retail stores and centers, resorts (both land-based and ocean-faring cruise ships!) and cultural or gaming facilities, to urban, natural, heritage and theme parks, to civic architecture, public spaces and infrastructure– are asking themselves ‘what can permanently integrated, especially interactive, multimedia platforms offer to my destination?’ "
Well said, and without even using the VR, AR, and AI verbiage being tossed around not only at SXSX but everywhere these days. In fact, what we’re seeing now is a shift in emphasis from also those clichéd VR applications (mainly just photo opps of someone wearing a VR headset) and endless press releases about devices using AI in everything, to rigorous designs that bring more rigorous display, image processing, and data visualization tools to real installations. Will Chase of Obscura, and Adrienne Katz of BBDO at the Finalist Showcase Sunday for the SXSW Interactive Innovation Awards. Interestingly, Will Chase, the head of communications at Obscura, brought home the point that the much-hyped “VR” term in every quarter now has a new meaning for their company. Obscura was the technology designer/provider behind the finalist entry here, in Visual Media Experience category, for the GE – Unseen Stars installation, that used the huge ceiling of Grand Central Station in New York City, last September, for a pixel-mapping driven, huge architectural screen tribute to women scientists in U.S. history. Anyone reading this report knows how high lumen pixel mapping, using big gun video projectors–from the likes of Christie, Barco, Panasonic, Epson, Digital Projection, NEC, and other projection providers– can transform any architectural space from a domed ceiling to the entire façade of a huge museum or skyscraper into a stunning digital palette that can make any visitor put down their smartphone and gape in awe. The Unseen Stars temporary installation ran for 3 days last September, to rave reviews from the public. 32 Christie Boxster projectors were used on the project. Obscura was responsible for all the projection technology, as well as the content design. Obscura’s Will Chase hit the nail on the head when I spoke with him Sunday, discussing among other things huge powerful video tools vs. yet more “VR” hype from every corner. “We do what we call ‘collective VR’”, said Chase. “VR with a VR headset, is one person at a time. We create large scale experiences, that can be shared”. Collective VR– make a note of that. That’s the future and growth market for sophisticated technology provided by many reading these pages.